The Greek word Syene (from which the Coptic Suan is derived) stems from the ancient Egyptian Swenet, meaning ‘making business’ or trade. 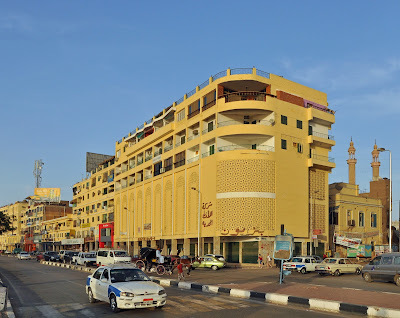 And herein lies the character of Aswan. It has been a flourishing borderline market for thousands of years; the link between two cultures: Egyptian and Nubian. 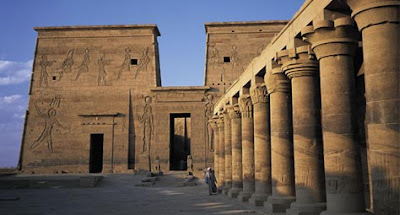 The surrounding land was rich in building materials: the Aswan quarries were the source of fine and coarse quality granite from whence builders and sculptors throughout ancient Egyptian history drew their supplies. Quartz, which was used for polishing stone, was mined from the so-called alabaster quarry north of Aswan and also from the western desert. In the eastern desert there were iron mines where red ochre was extracted for paint. And the largest sandstone quarry in Egypt was situated at Silsilla, further northwards. In antiquity the island of Elephantine was known as Abu or Elephant Land. It commanded the Nile cataracts that formed a natural boundary to the south. These great granite-toothed boulders had been tugged and torn from the mother rock by countless floods and lay like huge obstacles on the river-bed. 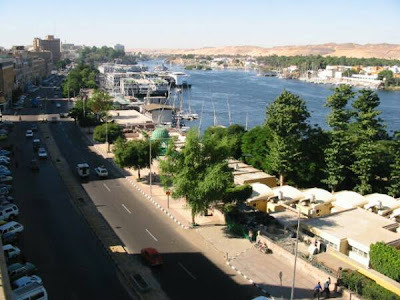 At low Nile a sluggish river would wind a sinuous six-kilometre descent from the island of Hesseh to Aswan. When the water began to swell with the annual flood, however, the river’s mood would become restless. Confined by mountain ranges on each side of the valley, the river would dance or whip around the granite obstructions. Fed by the monsoons on the Ethiopian tableland, the Nile would continue to rise until, reeling and rushing, churning and roaring in agony to find an outlet, it would hurl into the channels of Aswan. Classical writers described the sound as so great as to cause deafness.